First off, what is a French-style gallery? And second, how can you capture the look without spending a whole afternoon drilling random holes in your wall? To better understand the classic French way of hanging art — sometimes called “salon-style” — PatronArt offers you a peek into the fascinating origins the famous French salon. Then, we’ll show you how to get an effortless-looking gallery wall in your own home using tricks of the trade from pro art installer Todd Rector. The Salon began as an exhibit for the graduates of The Royal Academy of Painting and Sculpture, and was held annually in Paris, beginning in the 1670s. 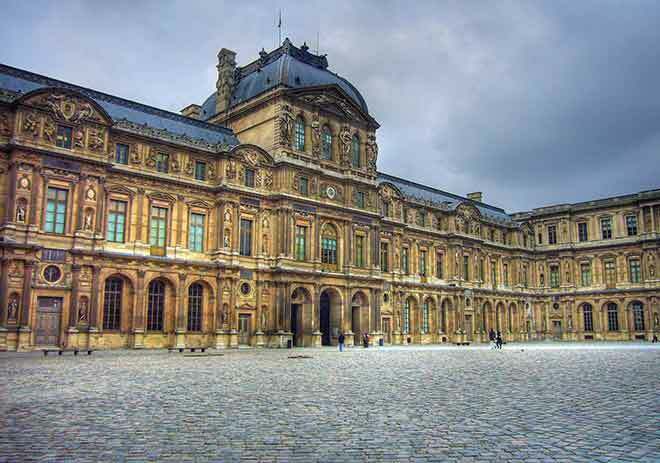 A semi-public exhibit, it was named for the room in the Louvre where it was held, the Salon Carré, or “square room.” It was later opened to the public in 1737. There were a lot of graduates and not much space, so it was customary to cover every inch of wall space in the Salon Carré with paintings. Sometimes it was so crowded that paintings were hung on top of one another. Although opening the exhibit to the public democratized the act of viewing art by letting people of different social classes mingle in the same space, salon-style hanging had its own rigid hierarchy. The best and most important paintings (according to the judges) hung at eye level. They shuffled the paintings deemed less important to the bottom or top of the vaulted room, like undesirable products at a grocery store. Eventually, the Impressionists swooped in and changed all that. They hung their paintings at eye level so the public could get a better look. What does salon style look like now? Today, salon-style hanging is resurfacing in popularity because of its charming, visually dynamic look. 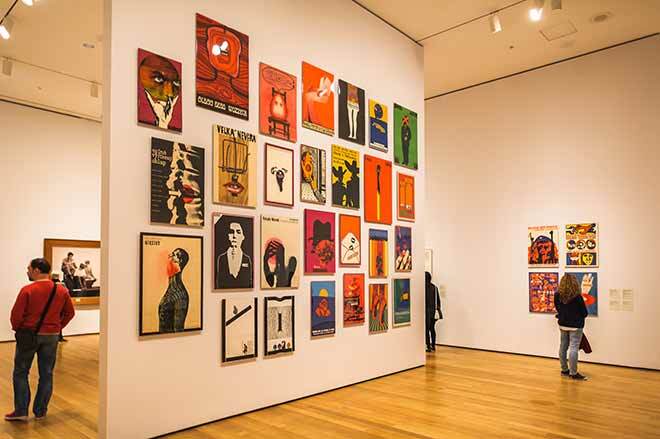 Art installers generally take a more holistic approach by abandoning the floor-to-ceiling look, and hang work more or less along the eyeline. Instead of using the free-for-all-method, they carefully consider each artwork, and think of it as part of a whole piece. Hanging salon style takes a little more planning than traditional hanging, so PatronArt sat down with professional art installer Todd Rector for a few tried-and-true tips to turn your empty walls into a modern-day French gallery. So how do you go about hanging a bunch of puzzle pieces? Step 6: The final number is the distance you’ll measure from the floor up. Mark this point with painters tape. So how does all that apply to salon style? “With that layout, the 58-inch center is still there,” Rector says. The easiest way to keep your salon-style gallery wall at eye level is to pick one piece, find the eye level with Rector’s handy formula, and use it as the center of your grouping. You can then build your gallery wall out from this point. Arranging on the floor is a tactic Rector uses during salon-style installations because it works well for more complicated groupings. 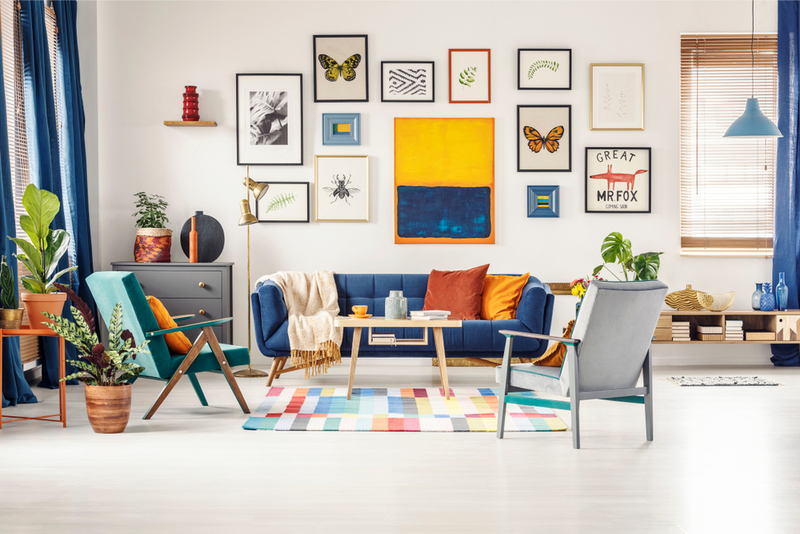 Even though these are basic rules you can follow to get a stunning gallery wall in your own home, you’ll typically have a little more freedom with where you decide to place your gallery. Feel free to play with an asymmetrical layout. Experiment with different colors and styles, and don’t be afraid to let your gallery wall play off other design elements in your home. Bonne chance and au revoir! Don’t have enough art to hang gallery-style yet? Maybe we can help. Visit PatronArt to request a free, 15-minute consultation with our in-house art curator.